s she about to break up with you? Well, if you are having a hard time determining whether your girlfriend is just upset or if she's planning on breaking up with you, then it's probably the right time to look into it. You should always trust your instincts. Every relationship goes through a rough patch every once in a while, but if the one you are going through is a bit longer and more severe than usual then you may be in danger of losing your girlfriend. It's your responsibility to find out the cause because you can be sure that your girlfriend will not be saying anything. You need to know the telltale signs that she's considering breaking up with you so you can do something about it. Here are some of the most common signs that your girlfriend is going to break up with you. You need to act fast as soon as you notice them. 1. Dry and Lifeless Conversations- If your recent talks have become bland and monotonous, this is a clear sign that your girlfriend is seriously contemplating breaking up with you. If she's stopped teasing you playfully and she doesn't get upset at you if you forget to call her or even send her a text, then she has probably lost any feelings she had for you. If you do not do anything to rekindle her feelings then you'll probably find yourself becoming single pretty soon. 2. No More Plans for the Future- If in the past, you and your girlfriend used to have conversations talking about planning for your future together, but recently those talks have stopped, then that is a clear sign that she does not see a future with you in it. If she's stopped using the words "we" and "us" when talking about her plans then those are clear signs that something's wrong and a breakup may be imminent. Test her; see how she reacts when you talk about your plans for your future. If the conversation becomes awkward and she tries to avoid the subject then you have your answer right there. It's even worse if you try to bring up the subject and she becomes frustrated at you. 3. She Stops Prettying Herself Up For You - If at the start of your relationship your girl used to take time dressing up her hair and putting on her makeup before you went out on a date, but recently she decides to let herself go and even stop dressing her nails for you, then you can be sure that she will be leaving you soon. She may be behaving this way so that you will become disgusted with her and leave her on your own. 4. No More Physical Intimacy -If your girlfriend starts dodging your every advance, not giving in to your kisses, or even your hugs, then you do not need to be a rocket scientist to know what will happen next. If you see one or more of these signs in your girlfriend then you're definitely at risk of losing the woman you love. She may be considering breaking up with you but you may still be able to prevent it. You need to step up and confront her on how she's acting, try to find out what's going on head on. The answer to your problems might be simple to figure out or it may just be a misunderstanding. You'll never know if you don't ask. If you find that she is seriously considering leaving you then the absolute worst thing you can do is beg or convince her to stay. I know, that's easier said than done but that's what you have 2 balls for. You can ask her to stay, tell her you love her and that you want her to stay. If you want her to stay, you need to make her believe that a future without you is not a future that she wants to live in. As the guy it's your job to lead, don't chase her trying to convince her that she should stay, this will only make her run faster. She needs to see that with or without her you're going somewhere in your life, then and only then will she be drawn to you again. If you don't see yourself as a "catch" then why should she? here are many causes of domestic violence against women, but one of the main causes is drug and alcohol abuse. Abuse tends to happen when husbands/boyfriends or partners are in addicted states. Some causes stem from abusers who have learned the behaviour from their childhoods. It has been said that men who witness domestic violence as children, grow up to be "abusers" with women suffering similar childhoods grow up to be "victims". Women make up the majority of victims suffering from domestic violence. Women are subjected to punishments for making large or minor mistakes. This abuse can involve physical abuse, verbal abuse, physiological abuse and traumatisation. There are various organizations that provide support to women suffering from this epidemic. If you are suffering from abuse, you can obtain counselling by telephone. Counsellors can evaluate your situation and advice you. Not everyone wants to leave their abusive situations. Some women choose to obtain support not only for themselves, but their abusers. If this is the case, attempt to resolve your differences on a personal level with your partner, and engage the necessary steps to eliminate the violent tendencies. If you find that the violence is occurring resulting from something out of your control and you are in no way in a position to address the issue at hand. This means that you must consider the safety of yourself and your children. Women who choose to stay in abusive environments should carefully evaluate available options with taking appropriate steps in ending the violence. Sadly, sometimes women do not realize until it is too late that their abusers must want support in order for things to change. The situation might need different approach by carefully studying your abuser. Or in a serious situation, it may be obvious that your abuser needs urgent attention, in that case rehabilitation might be the option. There are other causes of domestic violence against women. The issue of abuse should be taken seriously before it gets out of hand or causes irreparable damage. bused men often hide out in abusive relationships because their shame shields them from change. They know that when they break the silence around the domestic abuse that they live, people will do one of two things. a) People will not believe that they are much less could be battered by a "little" woman. For crying out loud, the woman is probably not muscular, even though behind closed doors she projects four times the volume as he. She can be louder, more aggressive, manipulative, controlling, abrasive, hypersensitive, demanding, cruel, blaming... She can be just as abusive as a male batterer, yet people listening to battered men...listen with surprise and disbelief. b) People will laugh when they learn of the particulars of the abused battered men endure. This is especially true for men listening to battered men. Those without the sensitivity for the dynamics of domestic abuse can see an abused man's predicament as "laughable." Their reaction compounds the shame felt by abused men. And this sends them deeper and deeper into denial. Here are a few things you can do to deal with the shame of your living in an intimate relationship with an abusive woman. 1) See the enigma of domestic abuse as a social "disease." That is a dysfunction in an intimate relationship that robs the relationship of health and harmony. It's a condition void of respect, honour and equality. You may be a part of the enigma, but this "condition" that you live in is far bigger than you. 2) Recognize that the battering you are weathering is not about you. Rather it is characteristic of the intimate partner abuse. As much as your partner wants you to believe that you are responsible for the upsets in the relationship, know her blaming custom is characteristic of the domestic abuse. 3) Let the intensity of your shame be directly proportionate to your efforts toward change, rather than the opposite. Shame is your barometer that things are not well in your relationship. Instead of letting this shame shield you from reaching out, allow it to propel you toward remedy. As ridiculous as this may sound at first, you must honour your own shame. You did not create the abusive relationship, and you cannot change it by sustaining the status quo. You can inspire change in the relationship, but never by hiding out in the shame of it. You are the only one who can campaign for your health, well-being and your safety. So take yourself by the hand and let your shame ignite commitment to break the cycle of abuse before it spirals out of control. "Don't confuse me with the facts!" "I need to see this from my reality only!" Sound familiar? Have you noticed how arguments escalate with emotional abusers? They tell you that something is bothering them in no uncertain terms, but often fail to fill you in on what the hell it is. So here you know fully what they feel, yet you remain in the dark as to why. Then, if you get lucky, they may expand on their issue with you...and you feel this sigh of relief, because now you have something you can deal with or at least address. So, you seek to share your perspective, your position...your point of view. And wham, you're cut off with, Don't confuse me with the facts. My mind is made up. You know a "but" is coming and with it is the next emotional assault. It may start with, "That's the problem with you... You're too intense, too convincing, too late with this explanation, too whatever to compel me to take you in and actually hear that you have something to say...worthy of my attention, much less my consideration." Get the picture? The emotional assault or blow to your character is their effort to tilt the scale, because in that moment they are tasting their own vulnerability. Part of how they deal with their personal vulnerability is to make you wrong in order for them to be right. As you know, from where they stand, they must be right. So, don't confuse them with the facts. What emotional abusers are really telling you is that there is no room for your reality in a discussion with them. Embracing your point of view is beyond them. You see, your perspective doesn't warrant their consideration, because they have already made up their mind and they really don't want you to confuse them with your facts. You feel unheard in that moment because you, indeed, are... You are not granted permission to share. You are not to have an opinion that differs from theirs. You see, if you hang on to your point of view, there is a price in this interaction with an emotional abuser. The price you pay is verbal emotional abuse. You know the discussion is over, so you pull it back and lick the wounds inspired by the emotional abuse dished out to keep you in your place. If you are following me in this description of this interaction, then you have probably experienced verbal emotional abuse. It is both subtle and significant. It leaves you emotionally off base, sometimes even before you know what happened. If this is the pattern of interaction with your intimate partner, take a hard and fast look at the dynamics of abusive relationships. The better you grasp these dynamics, the easier it will be for you to break the cycle of abuse before it spirals out of control. 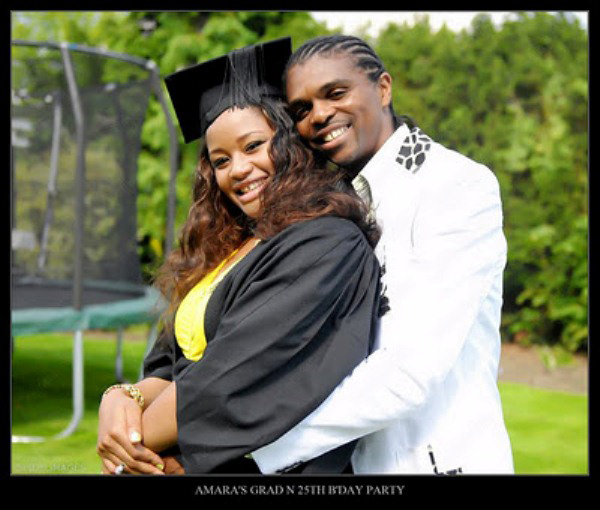 anu Nwankwo and Wife (Amarachi) happily united as ever! t first glance, the notion of online counselling makes many people bristle. However, upon further examination, the idea of online counselling starts to make sense. There are lots of benefits associated with getting counselling online. If you and your spouse are considering marriage counselling, it may be helpful to see if online marriage counselling is a good option for you. Make sure to find a reputable website that offers quality counselling. There are many benefits to receiving counselling online. One main benefit is that it doesn't require a long commute. Many rural areas just don't have the resources to offer counselling locally and sometimes people have to travel over an hour to the nearest counsellor’s office. The extra time and financial factor can make it impossible to attend regular sessions with a long commute. Another benefit is that it can provide some added layers of confidentiality. Although your communications with a counsellor are going to be confidential, it is quite possible you might run into someone you know in the waiting room. People with high profile jobs in the community may not be willing to be seen entering a counsellor’s office. Other times, people are too embarrassed to seek out counselling face to face. Some online counsellors don't even make you give your real name and you won't be given a mental health diagnosis that shows up on health record. Online counselling tends to offer more flexibility. Counsellors are often available to meet the needs of various work schedules. It also tends to offer alternatives to the "weekly hour" of therapy. Sometimes people use chatting and other times, email options are available. Some websites also offer phone counselling sessions. This can often better meet the needs of people with busy schedules who cannot take time off from work to attend counselling. There are some potential drawbacks to receiving counselling online. In the case of couple's counselling, the counsellor won't be able to see your interactions as a couple first hand but will have to rely on how you describe it. Online counselling isn't appropriate for every situation. For people who are experiencing a crisis, such as significant suicidal ideation, emergency treatment is more appropriate. Online counsellors may not be appropriate for other serious conditions but may be able to answer some of your questions or provide you with short-term consultation. What Sorts of Marriage Problems Can Online Counselling Help With? Online marriage counsellors can assist you by answering questions you may have about marriage. They can also provide you practical solutions to various relationship problems such as communication issues, intimacy problems, conflict resolution, and anger problems. Online counselling can assist when people are concerned about their marriage, want to strengthen their marriage, are already separated, or are considering divorce. You don't have to wait until you start having a lot of problems before seeking help. Online counsellors can assist you in keeping your marriage healthy as well. If your partner refuses to attend counselling with you, consider getting help for yourself. You may be able to learn skills and strategies that can help your marriage, even if your partner isn't willing to seek treatment. Online counsellors can assist you in recognizing behavioural changes that you can make, can assist you making changes that will change your relationship. eople today seek life partners on the internet. Unlike the past decades when there was no such connection. If you're one of those people who seem to not have luck in finding a good partner, there might be something you've done or didn't do. The following guide will help you establish your need and be satisfied. Always be at reputable sites. The simplest move yet the biggest mistake you can commit, is be a member of a site that hosts malicious content. If you really want to meet a person for a serious and committed relationship, you need to go to decent sites instead of showing yourself anywhere that you can. Choose the sites you sign up for and limit them. The saying "the more, the merrier" isn't applicable when it comes to online dating. Before entertaining anyone, examine their profiles thoroughly. You wouldn't like being in a situation wherein you have to chat with 10 different people. It will remove your focus on all of the conversations. If you get people to contact, read their profiles and don't base your judgement on their profile pictures. Find out a few things about them by reading what they have provided on their pages, their comments and responses. Don't take too many risks in choosing them. If you have 5 options, choose about 2. Select those that have a lot to say and have interests that you think are compatible with yours. The more things you can talk about, the better the conversations are. Don't commit yourself too early. The problem of most people nowadays is that they let themselves develop personal emotions for the person they are currently talking to without even any signs of the relationship going further. Hoping is good, but you have to control yourself a bit. There would be time for that. You don't have to force yourself on someone just to get them to like you. If they don't seem interested about your personality, then leave them alone and consider your other option. Online dating advice is very important when it comes to meeting others. If you are new to the dating world, it is easy to make mistakes. These errors can cost you chances at valuable and long lasting relationship. The following online dating tips can help you avoid mistakes and know what to do. Appear intelligent. Most people want to be with someone that has intelligence and knows how to use it. If you are writing an initial communication it should be easy to understand and not full of errors. Nothing turns most people off more than a message full of errors. Avoid often used phrases. If you want to impress someone as different, use words that are a little different. Term like "see ya later" does not show originality or wit. People appreciate someone in their life that is witty and is not a mundane and uninteresting person. Take time and think before you write. Use first names. If you start a communication with Mr. Or Miss Smith, they may think that they are receiving a sales message. This is not a good way to start things off. When you start a letter with Stella, or Frank, this gets immediate attention. This puts you on a first name basis at the start, and this is a good way to begin. Know the other person's interests. Try to learn all you can about the other person. If they have a social network page, visit it and collect information. Look for common interests as this helps to avoid painful periods of silence when you first meet. When you don’t have common interests, you may be wasting your time. Understand the importance of listening. Talking is easy but listening takes a lot of discipline. Try to remain silent and allow your date to talk freely about his or herself. When you talk, ask important questions about the other person. Few people understand how important listening can be for a relationship. Once you become a good listener, you will never be alone. Learn from the mistakes of others. When you study and understand effective online dating advice, you have an important tool at your disposal. This tool helps you avoid common mistakes and a lot of unnecessary problems. This tool will set you apart from the competition and increase your chances for success.